In order to distribute nutrients and oxygen needed for metabolism, mammals need a highly efficient circulatory system. The main differences in circulatory structure between mammals and most other vertebrates are in the heart and in the red blood cells. The mammalian heart has four chambers (as do birds and crocodilian reptiles) compared to the three chambers found in the reptiles (except the crocodilians). The additional chamber is the result of a muscular wall (or septum) that divides the ventricle (lower half of the heart) into two chambers. In reptiles there is a single ventricle in which deoxygenated blood from the right atrium mixes with oxygenated blood from the left atrium. 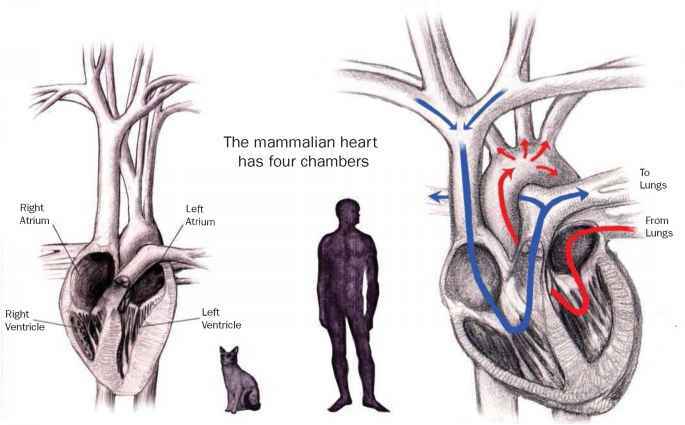 In mammals deoxy-genated blood enters the right ventricle only and is then pumped to the lungs. Oxygenated blood returns from the lungs to the left atrium and then enters the left ventricle from which it is sent to the systemic circuit and the rest of the body. Thus, mammals have separated the pulmonary and systemic circuits with the result that mammalian blood is more fully oxygenated than the blood of terrestrial vertebrates with three-chambered hearts. Additionally, mature mammalian red blood cells (erythrocytes) are enucleated, i.e., they lack a nucleus, and are concave in shape. Space saved by the lack of a nucleus leaves room for additional hemoglobin molecules, the oxygen-binding molecule. The concave shape also increases surface area and places the membrane surface closer to the hemoglobin molecules facilitating gas diffusion. Thus, mammalian blood is capable of carrying more oxygen than reptilian blood. alveoli. The alveoli walls consist of epithelial tissue through which gas exchange occurs. This structural arrangement of smaller and smaller tubes and saccules increases the surface area available for respiration. 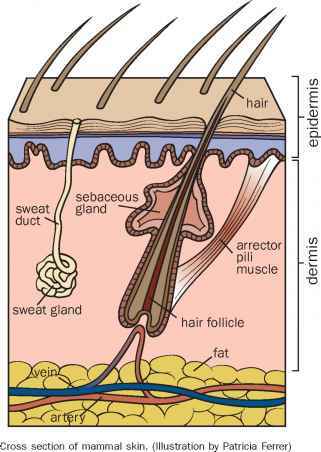 For example, the respiratory membrane of human lungs is between 750 and 860 ft2 (70-80 m2), which is about 40 times the surface area of the skin. Mammals have a layer of muscle that separates the thoracic cavity from the abdominal cavity. This is called the respiratory (or muscular) diaphragm. When this muscle is relaxed its domed shape forms the floor of the thoracic cavity. When it contracts it moves towards the abdominal cavity, increasing the volume of the thoracic cavity, which draws air in from the external environment. Which taxa have separation of oxygenated and deoxygenated blood? Why mammals have good effecient circulatory and respiratory systems? Which taxa have complete separation of oxygenated and deoxygenated blood? Which taxa achieve a complete separation of oxygenated and deoxygenated blood? What is the muscular wall that divides the ventricle in reptiles?